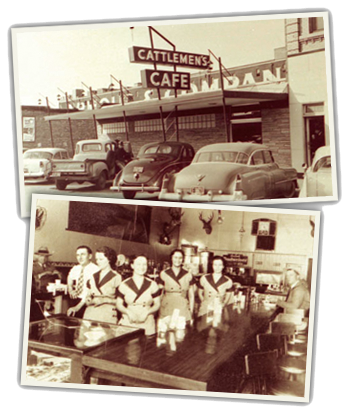 Every state has its historic places and stories, but few can equal the story of Cattlemen's Steakhouse, the oldest continuously operating restaurant in Oklahoma City! In 1945, Cattlemen's was owned by Hank Frey, a gambler of sorts. In a smoke-filled room at the old Biltmore Hotel in downtown Oklahoma City, Frey was running out of luck and money in a dice game attended by a local rancher, Mr. Gene Wade. Frey put up Cattlemen's as the pot if Wade could roll a 'hard six,' otherwise known as two 3s. Wade put up his life savings, which was a sizable amount of money. With one roll of the dice, Gene Wade was in the restaurant business. The '33' brand on the wall of Cattlemen's Hereford Room became a well-known symbol of Wade's good fortune. A look at the ceiling beams shows the growth of Cattlemen's. Starting out with cafe on the north side, which remains virtually unchanged after 50 years, Gene expanded southward a few feet at a time until he ran out of building. The South Dining Room and the Hereford Room are a bit fancier - a perfect place for a fellow to take his best girl (or his wife) for a steak dinner. Two backlit murals cover the southern and western wall of the dining rooms, photos of Gene and his father, two gentlemen ranchers rounding up cattle, both sporting jackets and ties. 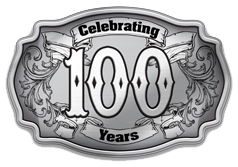 Since 1945, Cattlemen's Steakhouse has become a gathering place for all kinds of folks - from movie stars to rodeo greats, politicians to potentates! Check the walls of the dining rooms and view the drawings of all the well-knowns who have sampled Cattlemen's fare. 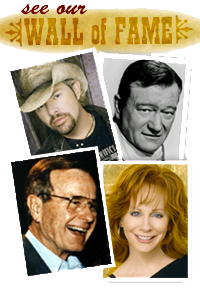 Gene Autry, John Wayne, Ronald Reagan (before he was President), and more recently, Reba McEntire. In the early '90s, George Bush (the elder, while he was President) stopped in for a good meal and a stiff drink.